Akira Yamaguchi created this piece for “Dogo Étranger Map,” one of the art works included in the event “Dogo Art 2016.” With much irony and humor, it depicts the town of Dogo in the city of Matsuyama from the point of view of an “outsider,” much like the novel “Botchan” by the novelist Soseki Natsume who placed the story in Matsuyama where he lived for a period of time as an outsider. 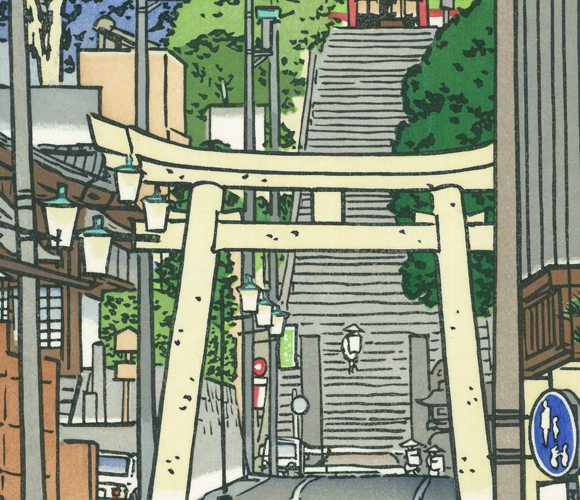 Isaniwa Shrine is located on a hill that overlooks the Dogo Onsen hot spring. 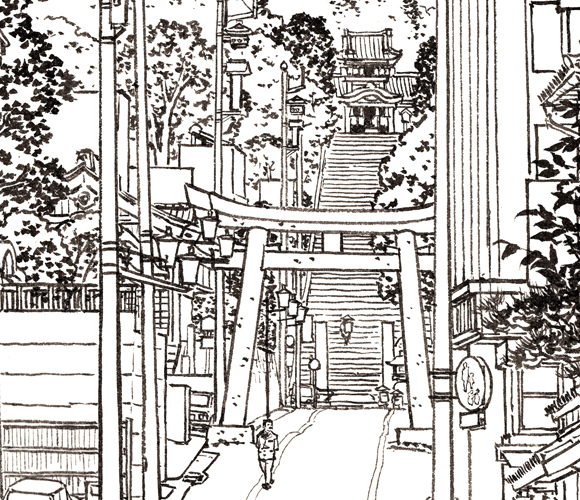 On the approach to the shrine leading to the long flight of stone steps is Mr. Yamaguchi dressed up as Soseki Natsume, the main character of the novel. This piece is a contemporary take on “meisho-e,” which are ukiyo-e prints of famous views. 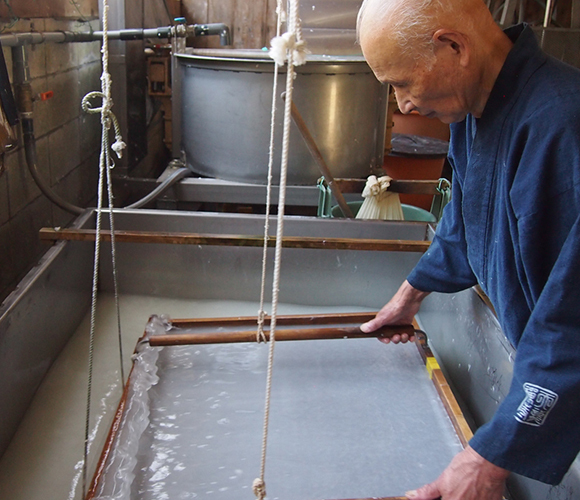 Akira Yamaguchi, dressed up as Soseki Natsume, creates a meisho-e of the famous Dogo Onsen hot spring. The extravagant tower gate at Isaniwa Shrine is one of Japan's three greatest double-gable roofs in the hachiman-zukuri architectural style. A steep flight of 135 stone steps leads to the precincts of the shrine. 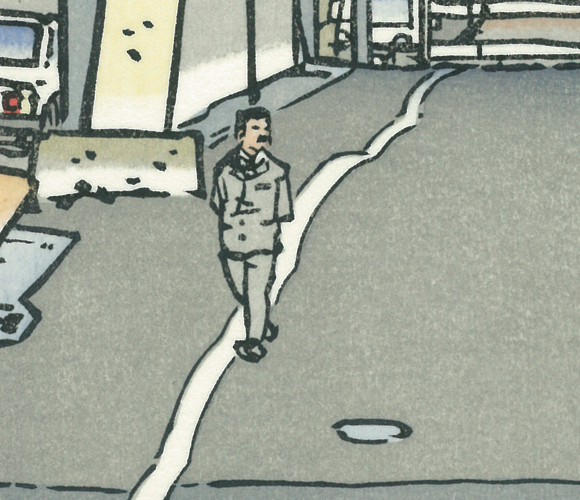 On the approach to the shrine is Akira Yamaguchi dressed up as Soseki Natsume, showing the artist's sense of humor. The hanshita-e created by Akira Yamaguchi. 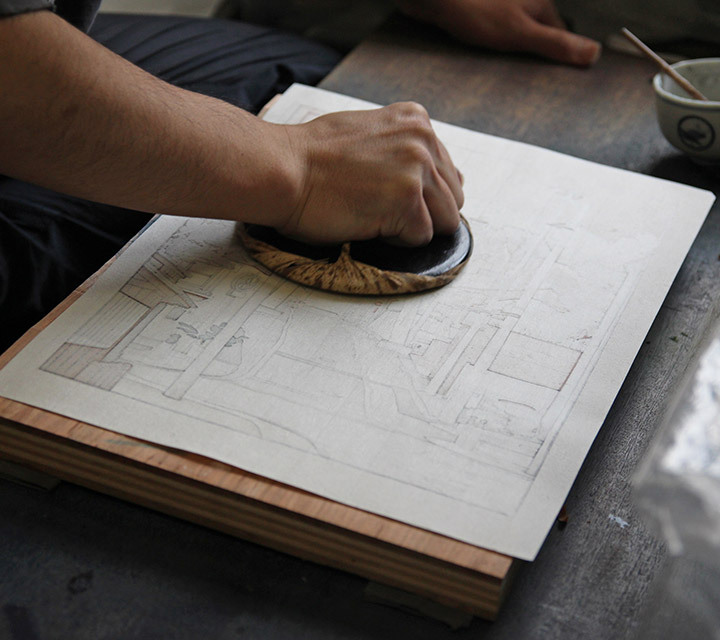 A hanshita-e is a kind of template drawing that acts as a guide for carving the printing block. 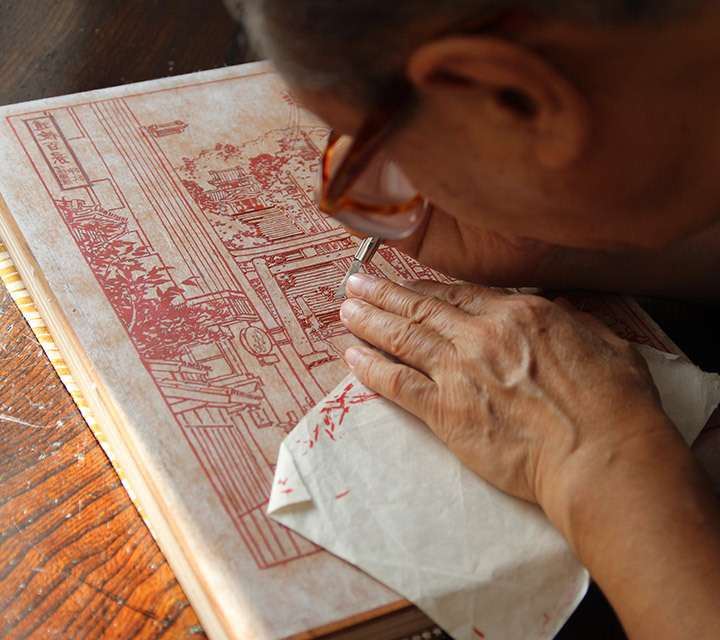 The carver feels the artist's brushwork as he faithfully reproduces the painting in a printing block. 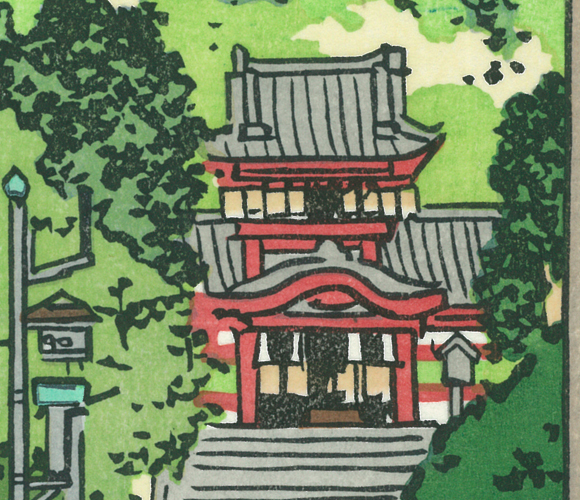 Printed individually by hand, each ukiyo-e displays the vivid colors that are a unique feature of woodcut prints. 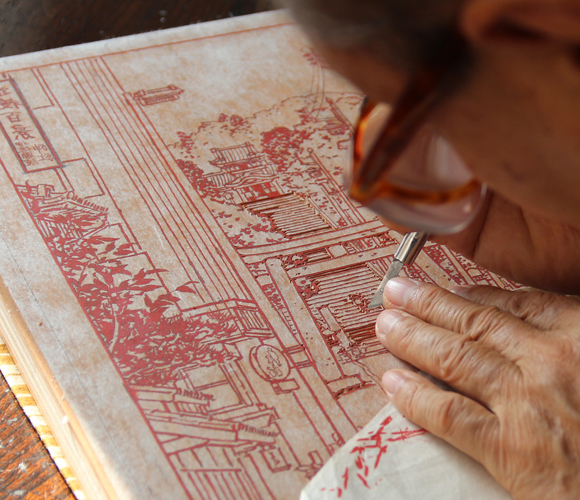 The ukiyo-e is printed on Echizen kizuki hosho washi (a unique kind of Japanese paper) handmade from 100% paper-mulberry fibers by Ichibei Iwano, a living national treasure. The artist's attention to details is faithfully reproduced by the carver. The carving of the outlines plays a particularly important role with regard to the works of Mr. Yamaguchi, who uses the lines to artfully express a sense of perspective and to create different textures. The carver interprets the artist's intent as he faithfully reproduces the lines. A technique called “bokashi” or gradation is used to create a greater sense of perspective in the meisho-e.
“Bokashi” or gradation is also often seen in meisho-e by Hiroshige. 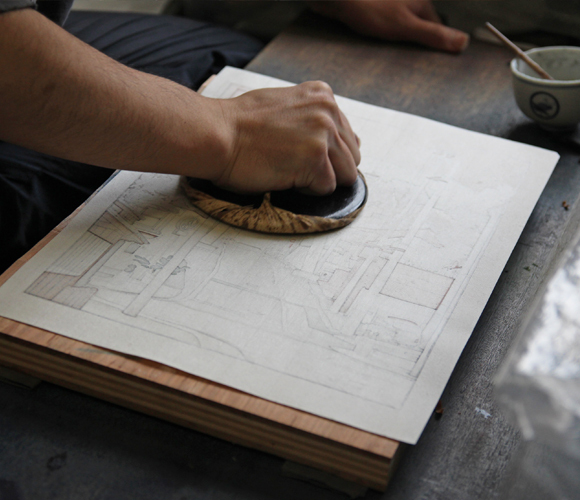 The printer uses his skills to create beautiful gradations on a flat printing block. 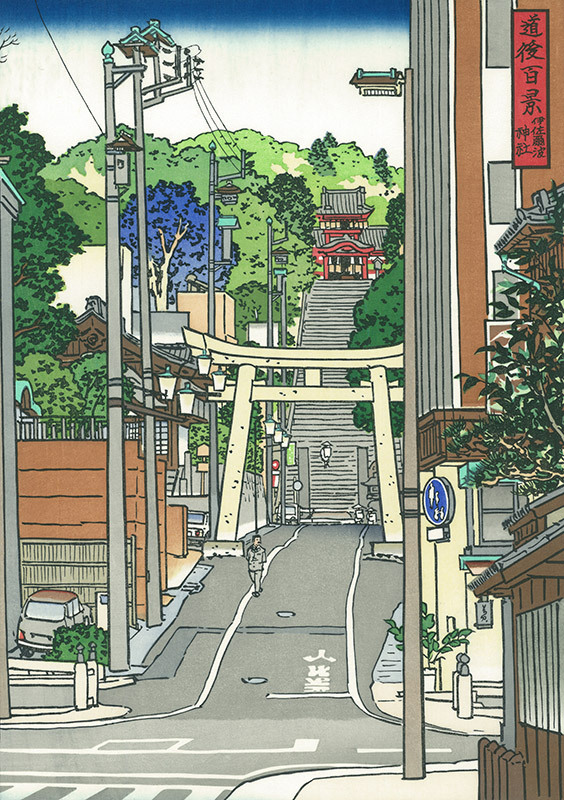 By using the “bokashi” technique in numerous places, a sense of perspective is created and the beauty of the famous Isaniwa Shrine in Dogo is captured even more vividly. Born in Tokyo in 1969, Yamaguchi grew up in Kiryu city in Gunma prefecture. In 1996 he graduated from Tokyo University of the Arts Graduate School (Painting Department) with an MA in Oil Painting. In 2013, his book “Hen-na Nihon Bijutsushi” won the 12th Kobayashi Hideo Award.Besides his bird’s eye view paintings of cities or battlefields, he traverses a variety of methods of expression including sculpture, manga and installation. 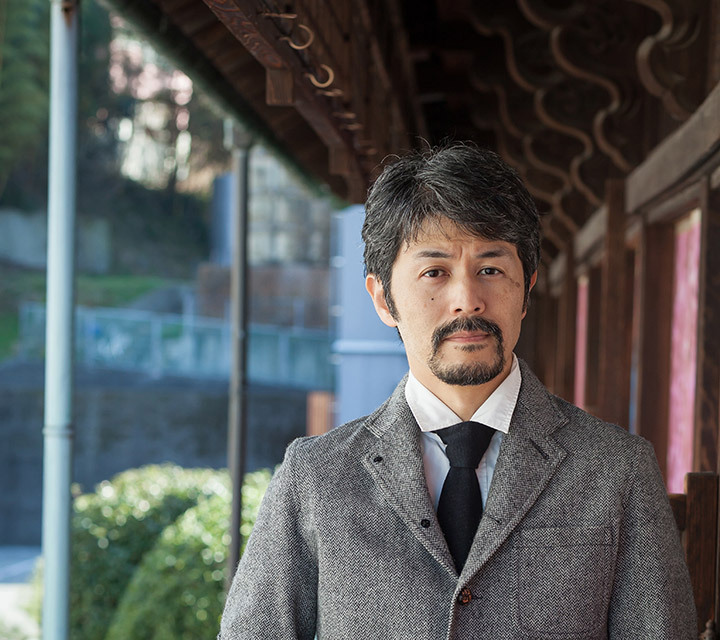 His major solo exhibitions include ‘TOKIORE(I)MIX” (Maison Hermès 8F Le Forum, Tokyo) and “Yamaguchi Akira: Stepping Back to Seek the Underneath” (Contemporary Art Gallery, Art Tower Mito) amongst others. 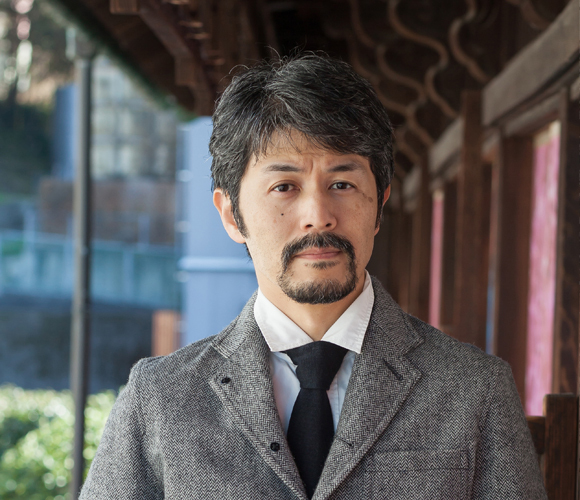 He has further developed the wide range of his practice through public artworks at locations including Narita International Airport, on Tokyo’s Fukutoshin Line at Nishi-Waseda station, and at Fujisan World Heritage Center in Yamanashi Prefecture as the symbolic central painting. Copyright © 2016 The Adachi Woodcut Prints. All rights reserved.